ACTIV X-ray for Capital Markets provides trading firms with a unique service to analyse trading venues quickly and easily. ACTIV X-ray is an ACTIV product engineered and operated by big xyt using the big xyt Cloud Platform. Customers are able to access delayed tick data from global trading venues with a unique data quality including master data, trades, quotes and market depth. Data is available for download, for visualization as well as for analytics. 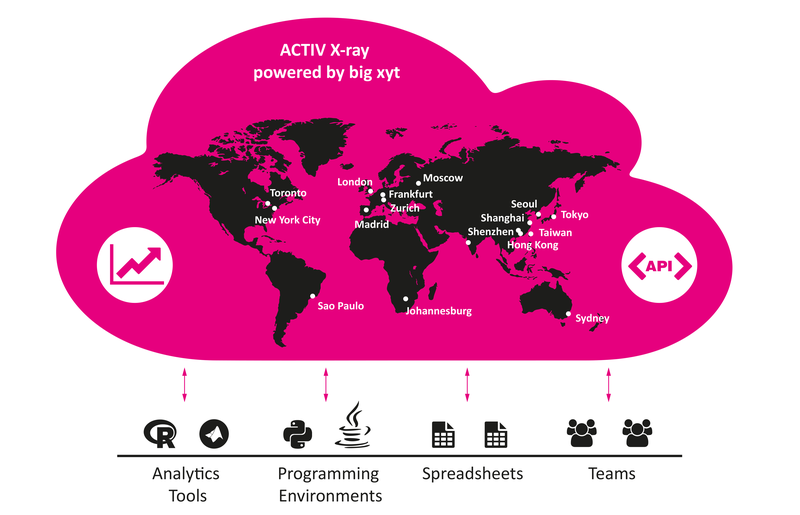 Leveraging the built-in API of the big xyt Cloud Platform, ACTIV X-ray offers seamless integration into any programming environment like R, MATLAB®, Java or Python. This allows users to access all available data sources and to integrate tick data analytics in the most convenient way. Access to tick data of more than 80 trading venues globally. Support for any programming environment including R, MATLAB, Java and Python gives users full flexibility. Tick data and analytics are seamlessly integrated into a graphical and interactive user interface. Enables users to filter and aggregate tick data within the Cloud Platform reducing the amount of data transferred over the network. ACTIV X-ray is continuously enhanced with new analytics functions using feedback from customers. The ACTIV X-ray analytics team integrates new business logic in hours, accelerating the implementation of new analytics. ACTIV X-ry is designed with the objective to offer the most convenient access to data and to analytics on large data sets. Immediate and secure access to all trading venues through the cloud. ACTIV X-ray processes data from more than 80 data sources and continuously adapts its business logic to market needs. This allows customers to focus on their core business. End users will enjoy the work with ACTIV X-ray as it is build for interactive analytics enabling the evaluation of new trading ideas quickly. ACTIV X-ray delivers tick data and analytics in a cost-effective way. There is no need for customers to enhance their existing IT landscape or to invest into new hardware or new software. Users can access tick data for all available trading venues and compare trading activity for selected securities across multiple venues using the tick-by-tick visualisation through the built-in user interface. ACTIV X-ray’s customizable analytics and interactive visualization enables end users to discover new trading ideas and opportunities. Algorithms can be immediately tested with tick data (including market depth where available) from more than 80 venues through the built-in API. User can execute interactive transaction cost analysis and benchmark own trades using tick data from all available trading venues. Replay and review any sequence of trading events observed on a single venue or across multiple trading venues. RSJ, one of the largest algorithmic trading firms globally, uses ACTIV X-ray to evaluate trading of new asset classes and venues quickly. When expanding trading activity to new markets, systematic trading firms rely on high-quality tick data to identify trading opportunities and to test models. Purchase a back history or start capturing real-time data – either from a data vendor or from the exchange. Allocate or buy hardware resources, software capacity and talent to load several terabytes of data into a database. Make data available to research and trading. With ACTIV X-ray, RSJ is able to immediately connect to all markets in scope via the big xyt API and start testing instantaneously. ACTIV X-ray offers access to high-quality tick data (trades, quotes, market depth) for more than 100 markets globally. Data is delivered seamlessly via API into the end user’s environment, e.g. R, MATLAB, Java or Python. big xyt enables customers to analyze all available data sets instantaneously without the need for IT investments.